As Britain heads for a weekend summit designed to seal its impending departure from the European Union, Spain is threatening to throw a last-minute spanner in the works over the tiny peninsula of Gibraltar. Madrid, which has long laid claim to the overseas British territory attached to the Spanish mainland, is threatening to derail the whole Brexit process over the status of ‘The Rock‘ – population barely 30,000. Spain fears the withdrawal deal does not explicitly hand it a post-Brexit veto on future relations between the EU and Gibraltar, which in a 2002 referendum voted overwhelmingly against shared sovereignty between London and Madrid. After Britain and the EU agreed to a draft Brexit declaration on Thursday, Spanish Prime Minister Pedro Sánchez repeated a threat to scupper the deal. 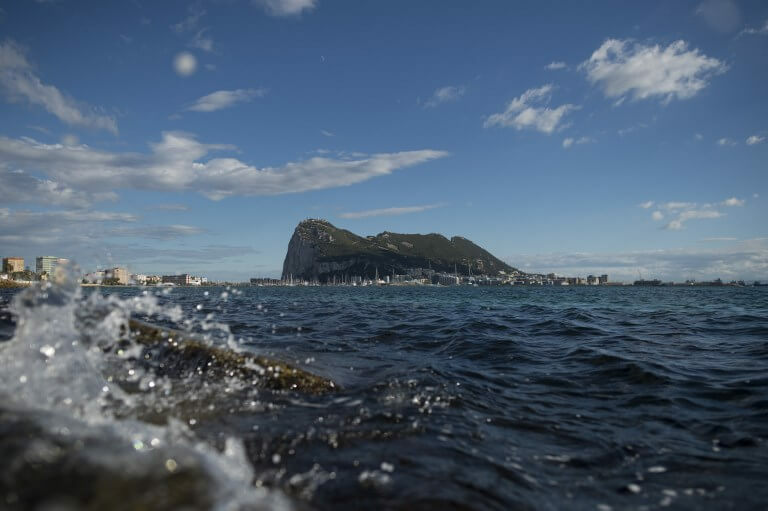 Gibraltar’s Chief Minister Fabian Picardo had earlier accused Spain of seeking to force an issue which has regularly driven a wedge between London and Madrid. The geography of Gibraltar – a 6.8 square kilometre rocky outcrop on Spain’s southern tip – meant that there was no shortage of reasons to cooperate with Spain, he added. Spain wants to negotiate directly with London on all issues related to Gibraltar, which was ceded to the British crown in the 1713 Treaty of Utrecht, after Britain leaves the EU. This had been provided for, initially, in a clause to the draft withdrawal agreement that effectively gave Madrid a veto on any Gibraltar-related agreement between the block and the UK. The clause has, however, disappeared from the final draft. And while Spain threatens to derail the entire Brexit deal over this omission, Gibraltarians say they are being used as pawns in a struggle for power. Elton Moreno, also 44 and a manager at a Gibraltar-based gaming company, said: ‘I’m not surprised. I’m surprised anyone is surprised that we’re being used in this tug of war. I’m just feeling tired that we always seem to be in the news. Gibraltarians voted by 96% to stay in the EU in the 2016 Brexit referendum. Prime Minister Sánchez on Wednesday said that ‘we are defending the interests of the Spanish nation and shall do so to the end’. In 1969, Spanish dictator Francisco Franco ordered the border between Spain and Gibraltar closed after Gibraltarians voted overwhelmingly in 1967 to retain links to Britain. The border only reopened 13 years later, seven years after his death. As tensions rise once more, barrister Moses Anahory, 48, complained it was ‘wholly unacceptable for the Spanish Government to threaten to exercise its veto over the Brexit Withdrawal Agreement at the eleventh hour. ‘Unfortunately, while unacceptable, it’s hardly surprising for Spain to raise the ‘Gibraltar issue’ at the last minute,’ said Anahory. ‘It certainly does nothing to create an atmosphere locally that Spain can be trusted to respect agreements it has signed up to,’ including a 2006 tripartite cooperation accord. Owen Smith, 41, a barrister, said: ‘Like the vast majority of Gibraltarians I voted to remain and I’d be happy to see the Brexit process derailed if remaining in the EU was the outcome.